I regularly use the Version 5.5 Developer portal, and now I am upgrading to Version 6.1. 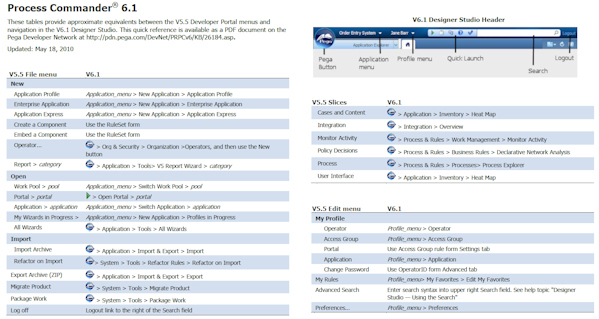 How can I learn the Designer Studio ways to accomplish the things I now do using the V5.5 Developer portal menus? As an aid to learning 6.1, you can download and print a four-page quick reference to identify approximate equivalents to use in the 6.1 Designer Studio. Right-click PRKB_26184_PRPC61MenuRef (110KB) to open or download the guide. You can print copies on a color printer. The page size in the PDF file is Legal size (8.5" x 14") in landscape orientation.